I ordered this 2x3 rug to match a larger one, just like it, that I had ordered earlier. I was happy with the quality and colors of the larger rug, so I decided to get another one. A transitional style area rug with a botanical motif in shades ofgreen, beige and red. 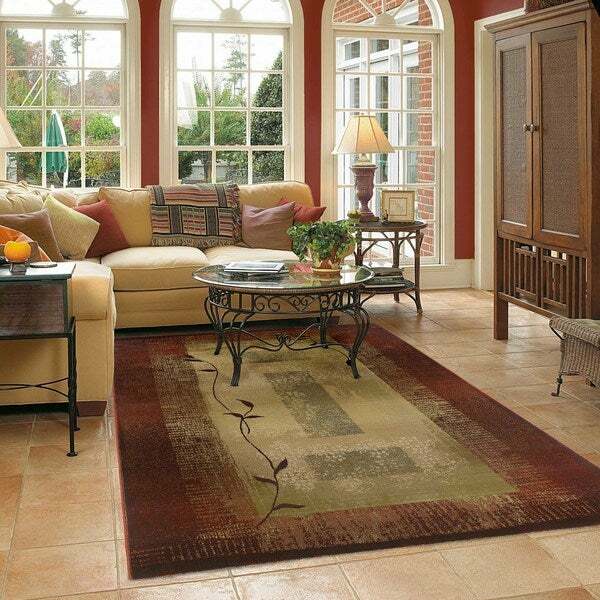 Featuring a durable yet soft polypropyleneconstruction this beautiful rug will make a wonderful addition toany room. Dimensions 36.0 In. X 24.0 In. X 0.43 In. I am remodeling my bathroom, and this rug will be more interesting than the standard bathroom rug. i chose this product because i bought the 3x7 rug to put down my steps and i want the matching rug at bottom. but i would prefer the round shape in 4ft i didnt see it so im sure you dont have it. Osti Boxes Red Contemporary Modern Area Rug - 7'10" x 10'2"
Copper Grove Aspromonte Red/ Beige Area Rug - 4' x 5'9"